Online Notes: Currently one of the biggest losers on Full Tilt Poker in 2008, having lost an astonishing $4.01 million dollars over just 18,794 hands. Pull your calculators out and you will soon see that "elmariachimacho" has lost $213.36 for every hand that he has played on Full Tilt Poker this year. "elmariachimacho" is a regular in the $500/$1000 No Limit Hold'em games on Full Tilt (GusHeaven and RailHeaven). Any time "elmariachimacho" sits down in the game, the table immediately fills up. Players refuse to leave the table as long as "elmariachimacho" is playing, which just goes to show what other players think of his game. Don't feel too bad for "elmariachimacho" though - if the account does in fact belong to Guy Laliberte, then there is plenty more money where that come from. Laliberte simply wants to sit with the best players in the world, and has nearly unlimited money to bankroll his hobby. Which of us wouldn't sit at "RailHeaven" against Phil Ivey and Patrik Antonius if we were worth over a billion dollars? We'd get hammered too. Live Notes: Working off the premise that "elmariachimacho" is Laliberte - Laliberte has three cashes over the course of his "live" tournament career. His biggest cash came at the $25k WPT Championship in April of 2007, where he finished in fourth place for $696k. The eventual winner of that tournament was Carlos Mortensen. 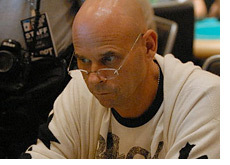 Laliberte also plays in some of the biggest cash games in Las Vegas. Other Notes and Info: By all accounts, Laliberte is an extremely nice guy who simply plays poker for the fun of it. He realizes that he is outmatched in most cash games, but doesn't care - he has a never-ended fountain of cash that keeps him playing in the biggest games. Guy is rumored to be appearing on the new season of "High Stakes Poker", which is set to begin filming in December of 2008.